We are so excited about this blog that we’ve decided to give all of our readers a free January 2012 Calendar to start this year off in style. In the haze of preparing for our blog launch, we needed something to give us deadlines for what we needed to do. And so we did what most people do: consult a calendar. But ours couldn’t be just any calendar; it had to look pretty! Our solution: design our own of course! But we couldn’t just keep it for ourselves – we had to share this original Ruby and the Swallow design with our readers. Simply download the calendar here and print it to either A3 or A4 size on any paper you have. Whether you stick it on your fridge or a pin-board in your room, we hope it inspires you for the month of January. Here’s to a great start to 2012! 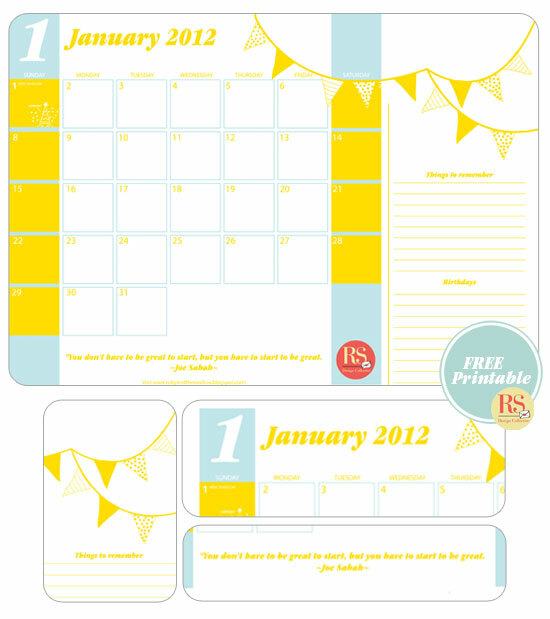 We will be giving you a free printable calendar every month this year, amongst other things, lucky you! Drop us a line and let us know how you plan to use your calendar!